Our second bar in the metropolitan area has arrived! Here, you can enjoy the Craft Beer that spread its wings from Ibaraki and flew across the world to represent Japan. You can enjoy beers from our standard lineup - which have won awards at the most prestigious competitions across the world - as well as specially crafted beers including limited-release seasonal specials and beers from collaboration projects. Don't forget to check out our original style of otsumami!Get on board with Japanese Craft Beer. Why not join us in giving life to Japan's Craft Beer culture! 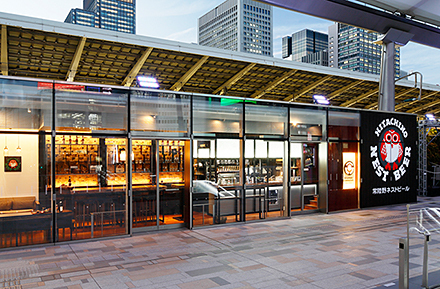 A brewing bar where you can enjoy HITACHINO NEST draft on tap, you can learn about beer and even brew your own!